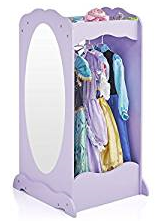 Top 12 Kids Dress Up Clothes Storage Units: Which One To Chose? Kids love playing dress up, and with the fun comes a LOT of costumes and accessories that need to be organized and stored somewhere. 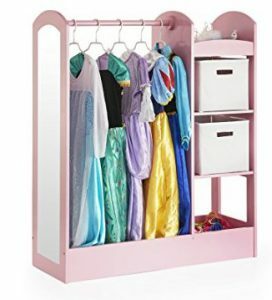 A trunk, hooks on the wall, baskets… or maybe a fantastic kids dress up unit? 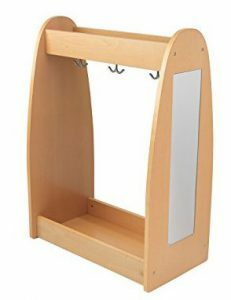 There are many different kids dress up clothes storage centers on the market. Which one is right for your child? 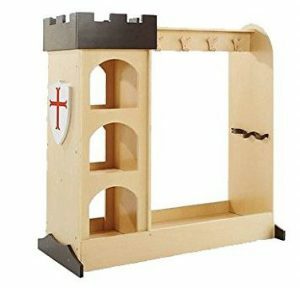 Welcome to our Top 12 Kids Dress Up Clothes Storage Units overview. Here, we list the top choices available right now – from various places online. Guidecraft and Kidkraft are both great product lines in the kids furniture business, and both have several options for us to explore – and there are others too! 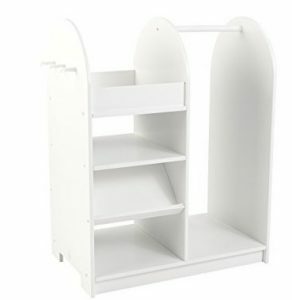 Below are pictures of each of the 12 kids dress up storage units – many with 2 links each. “Click To See Our Full Review” will take you to our in depth product review (these will be added as they come available, all as soon as possible). “Click To View Product On Amazon” will take you over to Amazon.com if you prefer to check out the listing and customer reviews there on that actual product right away. As always, let us know in the comments below if we can help in any way! We love hearing from you! 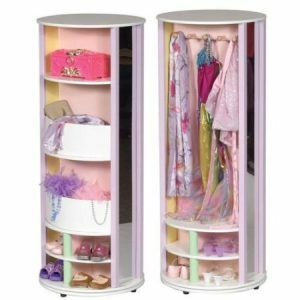 Why Consider Purchasing A Kids Dress Up Clothes Storage Center? Organized Spaces Are Inviting… Also To Children! We adults are drawn to areas and rooms that are inviting, organized, and interesting looking. We love to spend time near them and have fun checking them out. It’s the same with your children! If you love dress up – the creative learning that happens, the social interaction, the imagination… (see article here for more on why dramatic play is important), having a serious kids dress up storage center for their fun dress up gear will help draw them in – and you’ll be silently encouraging them to play. 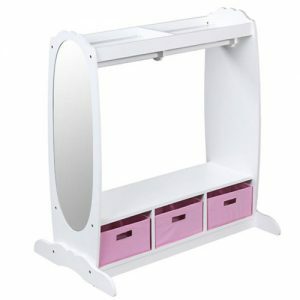 It Makes Tidying Up The Playroom Easier! Handy? 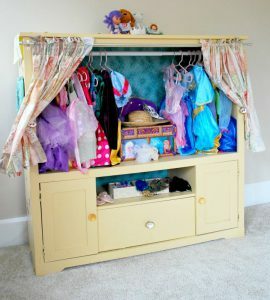 Click to see our post on DIY Dress Up Storage Units! When my children began playing dress up, they didn’t have a very big collection… so it all got tossed in a big old Rubbermaid, and that was just fine. But gradually their collection grew… and grew… and grew. Every Halloween, and frequently trips to the thrift store see costumes and accessories added. A Rubbermaid just doesn’t cut it when you get to this point. Not having a good system for your kids dress up storage leads to one big, disorganized mess. 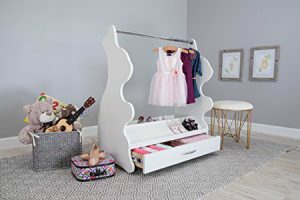 With a dress up storage center like one of these 12 featured here, one that is sized specifically for little ones, they can (help you) keep the playroom nice and neat! Have you heard the saying “out of sight, out of mind”? If the dress up clothes are in a box somewhere, they won’t be played with all that much. 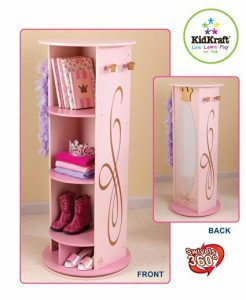 Having a dress up storage center really allows kids to see just what dress up clothes they HAVE… and accessories too, at a glance! And SEEING those gowns, role play costumes, capes, and general dress up gear makes them want to PLAY WITH THEM MORE! (Win for a busy Mom, right? 🙂 ) Oh yeah… and if your child has play dates at your house, trust me… dress up will be a HUGELY popular activity! Make Those Costumes And Accessories Last! This one will depend on what kind of person you are… or what kind of child you have. Do you care about wrinkles and small tears in the costumes you’ve bought for your child? If you have a great dress up storage station, the costumes and gear that you paid good money for will likely last a lot longer too. Which is great! No more dresses squished in a ball, no more dress up wigs wrapped around girls dress up shoes… necklaces “lost”, capes with wrinkles, hats squished, and the like. Note – also available in other colors. Note – also available in Espresso. Note – also available in Natural color. Note – also available in other style themes. Note – also available in other colors, as well as in Bear or Lion shape. 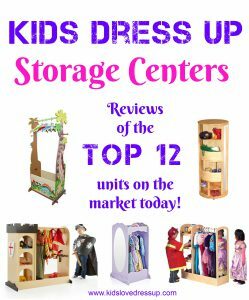 I hope this was a helpful overview of the variety of kids dress up clothes storage units that are available on the general market right now! Have another one you would like reviewed? I would be happy to help you out any way I can with your decision making! Cool Dress Up Storage For Boys: Trunks, Storage Units and More! Dress Up Trunks For Little Girls: Go Cute Or Go Practical? Dress Up Storage Ideas: Which Style Will Work Best For Your Needs? 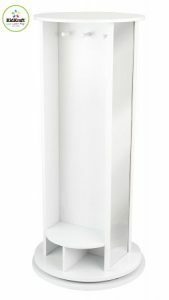 Guidecraft See and Store Dress Up Center – Is This The Best Dress Up Storage Unit? 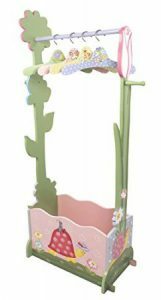 What Are The Best Toys For 3 Year Old Girls? 10 Things To Keep Her Busy And Happy!